Girl Scout Leader 101: Sisters For Life! From the very beginning of the Girl Scout journey, we tell our girls that we are sisters. I have a biological sister. I have a sister-in-law. I love both of them immensely. When I'm at my worst, I call my "chissy". I spill my guts and I know she won't judge me... I don't talk to her enough and I do need to work on that. But, I also have this whole other family... a ton of sisters who are the most inspiring and amazing group of women I have even been involved with. I have gained so many friends... real friends... the kind that send you cookies when you move into a new home, flowers because they see the time you put in, gift cards for a bench in memory of your Dad, and words of encouragement every time you see them... REAL friends... the kind that take time out of their lives to attend your Dad's funeral more than an hour away from where they live... yeah... that kind of friend... I can't even begin to express the gratitude I have for their friendship. So, a few weeks ago I found myself "doing the math". I have been a volunteer for 6 years. 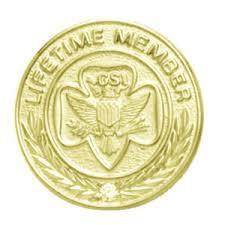 I had been toying with the idea of purchasing a Lifetime Membership for a few years now. It's a lot of money to drop at one time. I know... believe me, I know... but it means I never again have to register to work with Girl Scouts... yes, I do have to keep up the background check and the trainings to work with girls... but I don't have to fill out the form or complete the online member registration each year. It also gives me the flexibility to take a few years off at some point in my lifetime, though see notes above about the friendships and I don't see that happening for a while. It also gives me hope to know that somewhere down the line, if the girl has a girl or if a friend's girl has a girl... I can quickly pick right back up where I left and continue on with Girl Scouts. So, I'm very excited to belong to the sisterhood as a Lifetime Member of Girl Scouts. I also think they need more bling, because I'd totally be down with that!